Washington, D.C.: Asian American organizations welcome the introduction of the American Dream and Promise Act. The bill, introduced by Reps. Lucille Roybal-Allard (D-CA 40), Nydia Velazquez (D-NY 7), and Yvette Clarke (D-NY 9), provides a majority of undocumented immigrants eligible for the Deferred Action for Childhood Arrivals (DACA) program and individuals with status under the Temporary Protected Status (TPS) and Deferred Enforced Departure (DED) programs a pathway to citizenship. There are more than 11.5 million undocumented immigrants, 1.7 million of whom are Asian American. The top five countries of origin for Asian American undocumented individuals are India, China, South Korea, the Philippines, and Vietnam. The legislation would protect over 2 million individuals from detention and deportation by creating a permanent pathway to citizenship for these populations. Furthermore, approximately 120,000 Asian American DREAMERs and 15,000 Nepali Americans who currently live in the United States through the TPS program would benefit from the process created in this bill. The Supreme Court’s decision today to omit hearing the Deferred Action for Childhood Arrivals (DACA) case is welcome news, as it keeps the program alive and allows current DACA recipients to continue submitting renewal applications. While this is encouraging, the work ahead remains clear – we need a clean DREAM Act and permanent legislative solutions that do not include harmful provisions, as proposed by the Trump Administration last weekend. The Administration’s immigration “deal” from this weekend is no deal at all – it’s a sham. The Administration is claiming to reinstate two programs – DACA and Temporary Protected Status (TPS) – that the Administration itself made a decision to eviscerate last year. These so-called protections to TPS and DACA holders are half baked at best and do little to actually protect communities. The “deal” legislation that the Senate will likely introduce this week excludes entire communities. Anyone with TPS status from Nepal, Guinea, Sierra Leone, Sudan, South Sudan, Yemen, Somalia and Syria would not be protected. The bill only covers a fraction of all DREAMers and does not provide permanent protection from deportation. Most alarmingly, it includes a $5.7 billion dollar border wall and more bloated increases to detention beds and border patrol agents. “This ‘deal’ offers no concessions, no solutions, and will further undermine the rule of law. It will intensify militarization on the border and expand detention, while continuing to hurt refugees and asylum seekers, DACA recipients, and TPS holders. There are at least 450,000 undocumented people from India alone, at least 25,000 Indian and Pakistani DACA recipients, and nearly 15,000 thousand Nepalis with TPS status who will be directly impacted by this legislation,” said Suman Raghunathan, Executive Director of South Asian Americans Leading Together (SAALT). South Asians, along with all immigrant communities, deserve a real immigration overhaul that serves everyone. Once this sham bill is introduced, we will support our community members and partners to voice our opposition. We are devastated by the fatal shooting at Tree of Life or L’Simcha Congregation in Pittsburgh, PA claiming 11 lives and injuring many more. As a racial justice organization, we stand against white supremacy and bigotry in all its forms, and reaffirm our solidarity with the Jewish community in Pittsburgh and with Jewish communities all over the U.S. This is the third documented incident of white supremacist violence targeting a community in a house of worship in the last six years. In 2015, a white supremacist shot and killed nine Black worshippers at an Episcopal church in Charleston. In 2012, a known white supremacist shot and killed six Sikh Americans at the Oak Creek gurdwara in Wisconsin. Just last week, a gunman killed a Black woman and Black man at a grocery store in Louisville, KY, after first attempting to enter a Black church. We are in the midst of an alarming trend – white supremacist violence is intensifying as openly divisive policies and poisonous political rhetoric are rolled out with grim consistency. While the targets of this violence, policies, and rhetoric are numerous, we know fear is intensifying in our communities. 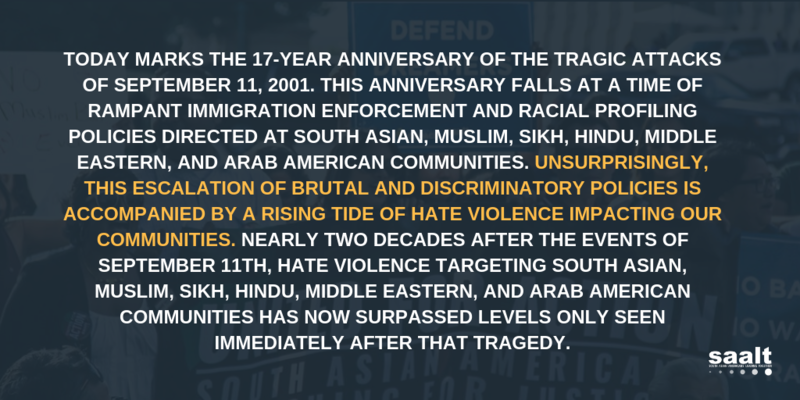 Since November 2016, SAALT has documented 416 incidents of hate violence and xenophobic political rhetoric against Muslim, Sikh, South Asian, Arab, and Middle Eastern communities alone. One in five perpetrators of the hate violence incidents from November 2016 to November 2017 referenced President Trump, a Trump policy, or a Trump campaign slogan.